The symbolic nature of the Dolphin in Christ consciousness tells us that, the healing tools given us through Mother Earth can heal all wounds. It is essential to remember that the Sacred Focus and Intent of the individual to bring the body back into balance and harmony with natural, cosmic, universal and magical law is the most important piece of the healing process. Changing Dolphin’s herbs, spread upon her cloak were scattered once and long ago. Yet she still remembers the powers of the Mother’s herbs, and is here to remind us of their secrets once again. Her herbs are supreme throughout the solar year, whether in seed and root, bud and stem, or flower and leaf. Fresh in spring or dried in the dead of winter, the herbs have effect. In the course of her wisdoms sharing, we may learn to use and appreciate the sacred power of plants, healing waters and sound vibration. Her medicinal herbs are powerful, offering cures for every part of the body. She works through nature's cycles, and through the energy that connects the body's joints and sinews in lines of power. Through our work with ritual in ceremony, we can strive to fulfill and restore the order. In devotion, study and gratitude we can work to heal our selves and others through the knowledge of plants. In honoring our gardens and all of Creation in our gratitude to the spirit world of plants and all elements, we can move the circle outward and work to heal our planet. Gentle is the feather on the breeze that surrounds and circles the bay. Moon commands the oceans waves they roar in the four winds everyday. Cathedrals underneath the sea, together they swim in circles we know. In the painting “Changing Dolphin” she carries with her tools for healing and moves in a circular motion like life, singing her a prayer for humanity. 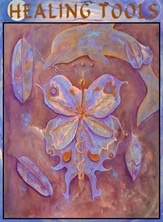 In the center is a butterfly and dragonfly merging as one, bringing the medicine of change in light. Probably no other animal or insect represents the metamorphous process of transformation and shape shifting than that of the butterfly. Butterflies have a long association in folklore representing the nature spirits in the Faerie realm, hence healing with plants. Dragonflies help us see through the illusion of pain, suffering and illness and on into the other side to Light. The Great Spirit is a circle, whose center is everywhere and whose circumference is nowhere. We are a creation from that circle and a circle of creation we are within our self. Our Circle, our Soul, has a center, a sacred point of contact where as a human being we meet the Divine in a transcendent communion. The center point of the circle is within the sacred sanctuary of the heart. It is where we experience the light and love of the Great Spirit within. This space embodies the Divine Feminine and it is where the light of the Divine Masculine is held, our Divine spark. Retrieving and bringing forth that which has been forgotten is an act of reclaiming power. To direct the energy back to the center, accesses healing and supports release of emotional wounds, pain and negative patterns of thought and behavior. This process consists of passing through the mental, then the emotional and finally through the physical layers of being where then it is possible to enter into the silent sanctuary of the heart. Changing Dolphin comes offering gifts of love from the Christ conscious communion with the Great Spirit, the source of all life. The answers we seek lie within our deepest self. Our inner levels of being are direct doorways to super conscious healing tools and when we access these levels we are able to create different situations and experiences, raising the level of life force energy, clearing blockages, replenishing vitality and reconnecting to the life force of all things. Our body is light (as well as spirit) and responds to consciousness. What ever we believe to be true is our constraint, so shall the body follow. When we awaken to the memory that we have no limitations, we are free. In the story of the woman who simply touched the robe of Jesus to get healed, he said to her, “Daughter, be of good comfort; thy faith hath made thee whole.” In this case her belief in Jesus’ was her Healing tool. When the body is out of balance, malfunctioning and is in pain we want to heal it as quickly and efficiently as possible. In addition to contacting a medical doctor, some alternative methods as nature originally such as healing with herbs, acupuncture and acupressure, chakra balancing, reflexology, chiropractic work, color, sound and stone therapy, hypnotherapy, muscle and tissue massage, drinking good water, etc. could be effective in helping to reverse the dysfunction. The symbolic nature of the Dolphin in Christ consciousness tells us that, the healing tools given us through Mother Earth can heal all wounds. It is essential to remember that the Sacred Focus and Intent of the individual to bring the body back into balance and harmony with natural, cosmic, universal and magickal law is the most important piece of the healing process.